Do you know which of your key pages could benefit from help in converting leads into customers? Has your key page never been optimized before? Or perhaps your page still does not exist and you wish to start off with a strong design? We live and breathe conversion focused UI design and can deliver rapid sketches for all of those situations. We'll target a key page that is most important to your business. You will receive one conceptual sketch of our ideal recommendation to your user interface with a deep focus on raising your conversion rate. When finished, we can do a call to go over the suggestions as well as answer any of your questions. We're experts in UI design with a focus on conversion optimization. 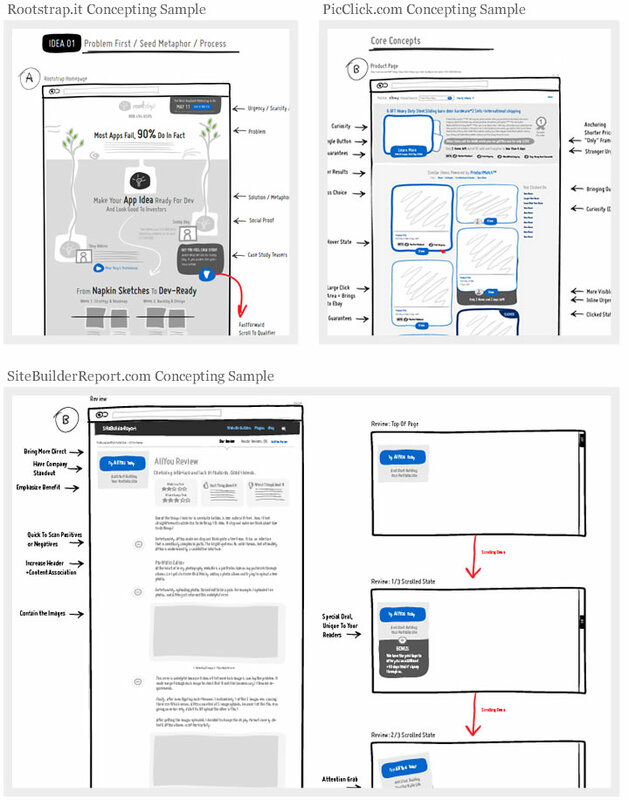 We've designed hundreds of screens and ran countless a/b tests. We share with you this deep expertise in sketch/concept form. We deliver most projects within 3 working business days. We might also include small variation ideas free of charge, should you wish to turn this into an optimization project. If the concept requires a minor iteration, we'll include one for free. If it requires further revisions, we can flexibly keep doing so at 1,000 per each iteration.